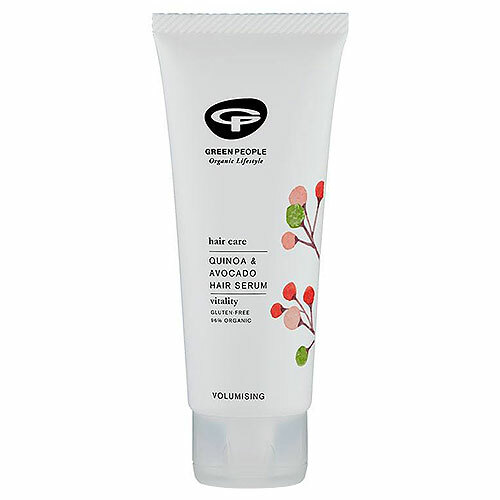 A nutrient-packed organic styling gel for weightless volume and intense conditioning. Avocado oil offers powerful conditioning for high-shine, gloss and softness. Aqua, Glycerin*, Levulinic Acid, Aloe Barbadensis Leaf Juice Powder*, Helianthus Annuus Seed Oil*, Olea Europaea Fruit Oil*, Persea Gratissima Oil*, Aroma [Zingiber Officinale Root Oil*^, Citrus Limon Peel Oil*, Cymbopogon Citratus Leaf Oil*^, Citrus Aurantium Dulcis Peel Oil*, Eugenia Caryophyllus Bud Oil*^], Rosmarinus Officinalis Leaf Extract*, Hydrolysed Quinoa, Panthenol, Faex Extract, Xanthan Gum, Chondrus Crispus Powder, Potassium Sorbate, Citral*, Eugenol*, Limonene*. Shampoo and towel-dry hair. Work a tiny amount of the gel into your hair from the roots to the ends using fingers or comb. Style as usual. 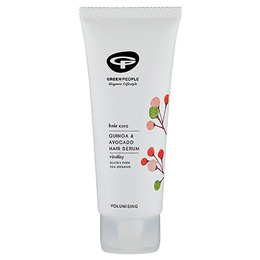 Below are reviews of Green People Quinoa & Avocado Hair Serum - 100ml by bodykind customers. If you have tried this product we'd love to hear what you think so please leave a review.